For this tutorial we are using the Catalog Me! theme, however you can use whichever theme you want. It means that the colors and layout can be different, however the content should be similar. The default page template in Catalog Me! theme is a page with right sidebar. For this tutorial we don’t need this sidebar so we will change the main product listing page template to full width. 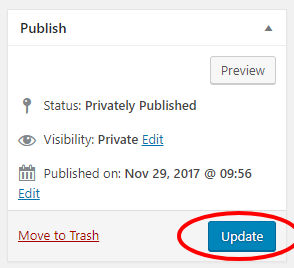 Now you should see a standard WordPress page edit screen. 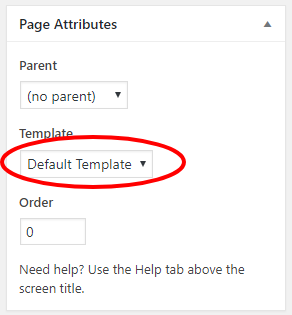 In order to change the template we will have to switch the ‘Template’ drop-down inside ‘Page Attributes’ box located on the right side. We will choose ‘No Sidebar Page’ option. Please note that the available options depend on your theme. In your case the option name can be different e.g. ‘Full Width’. Only one product called ‘Sample Product Page’. This product has been created automatically for demonstration purpose only. You should delete it as soon as you are ready with your catalog. If the page title is called ‘Private: Products’. This means that we’ve created a page with title: ‘Products’ and private status. ‘All Products’ is a catalog page label. This can be modified in Catalog > Settings > Front-end Labels. See the headings docs for details. The box with grey background that says ‘Product Filters Bar has now widgets’ is a widget area. You can add any widget there, however it has been designed for catalog widgets. You can find them in WP Admin > Appearance > Widgets.